Kuniyoshi's Sixty-nine Post Stations of the Kisokaido Road - Terrific print from Kuniyoshi's Kisokaido Road series, published between 1852 and 1853. The Kisokaido Road ran between Edo and Kyoto along a mountainous inland route, as opposed to the Tokaido Road, which followed the coast. Kuniyoshi created one design for each of the sixty-nine stations along the way, plus images for Edo and Kyoto. Each features a well-known figure from history or legend, along with a small inset depicting the station itself. These terrific illustrations feature wonderful detail and handsome settings, many with deluxe printing treatments such as fine bokashi shading or burnishing. A great choice for a Kuniyoshi collector or anyone interested in Japanese history and folklore. 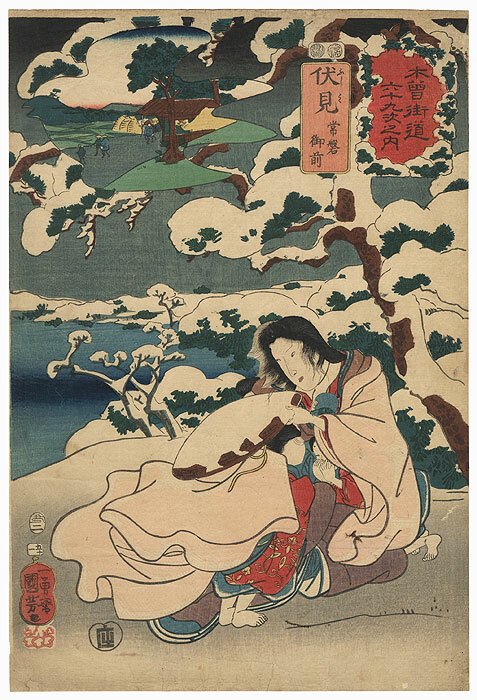 Fushimi: Tokiwa Gozen, 1853 - Terrific kabuki scene featuring Lady Tokiwa, the widow of Minamoto Yoshitomo, and her children in the snow. 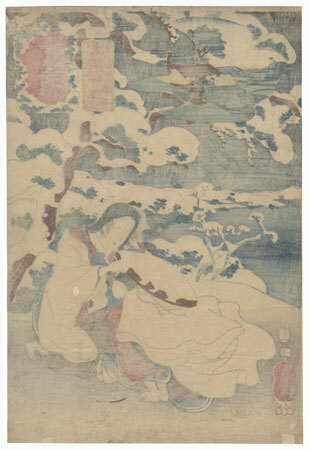 Yoshitomo was killed by Taira Kiyomori, and Lady Tokiwa fled with her three sons, but was forced to return when Kiyomori held her mother hostage. Here, the beauty clutches a baby to her chest as her middle son huddles at her side, blowing on his hands to warm them. 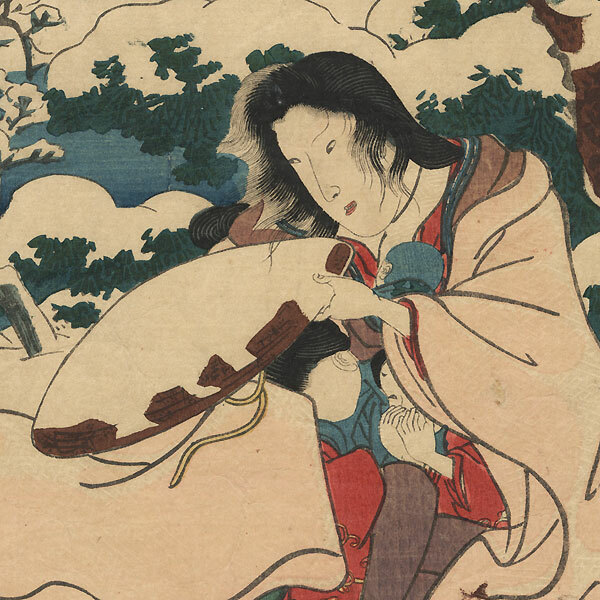 She shelters her eldest boy under the sleeve of her kimono, holding her snow-covered hat over his head. Snowy pines frame a view of deep blue water and wintry gray sky. A great design from this famous tale, with faint embossed detail on the beauty's robe. Condition - This print with excellent detail as shown. Small loss at edge, a few holes, repaired. Creasing, slight toning and soiling, a few small marks. Please see photos for details. Good overall.